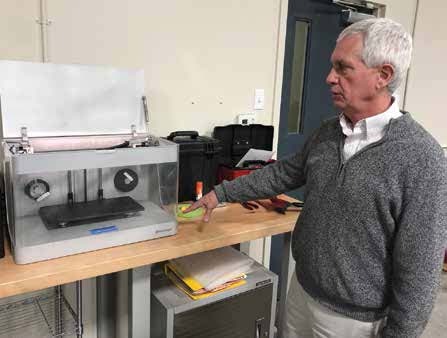 InterPRO Founder and CEO Kevin Dyer explains the qualities of a Markforged desktop 3D printer in his Deep River, Conn., shop. Photo by Mark Langlois. New, faster 3D printers are appearing today along with stronger, highly functional materials. Those improvements, along with improved CAD software and design for additive manufacturing, are growing the industry, said Kevin Dyer, CEO and founder of InterPRO Additive Manufacturing Group, in an interview at the company’s facility in Deep River, Connecticut. Dyer, who has worked in the industry since the 1980s, said the faster speeds and quality materials will be turning out parts competitive with injection molding. The benefits of 3D printing include speeding prototypes and parts into production, lowering engineering costs, and accelerating the testing and manufacturing of new parts. As the equipment, materials, and 3D CAD designs improve, customers are demanding more from their 3D printers. According to HP, its Multi Jet Fusion technology builds plastic parts 10 times faster than other printing technologies, such as selective laser sintering. The printers are fast, with outstanding economy. Faster and higher-quality 3D metal printing is also on the way from HP. InterPRO is a certified reseller of HP printers, and has plans to order the HP Metal Jet 3D printer when it is released late next year. Dyer said many major CAD software companies now offer tools to optimize parts for increased performance with lower weight. These tools are being made possible due to new additive manufacturing technologies as well as stronger new materials. “We see the evolution of part design and engineering moving quickly into this area. The practice is quickly growing,” Dyer said. Lower CAD software costs and printer costs are stimulating market demand, while improved part properties are also speeding acceptance. In addition to providing 3D printing systems, InterPRO (www.interpromodels.com) provides custom models and patterns on demand as a service bureau. InterPRO has been working with customers for 22 years to support their use of 3D printing for product development and manufacturing. InterPRO’s team of engineers, 3D printing experts, and model makers has more than 100 years of combined experience in using 3D printing. 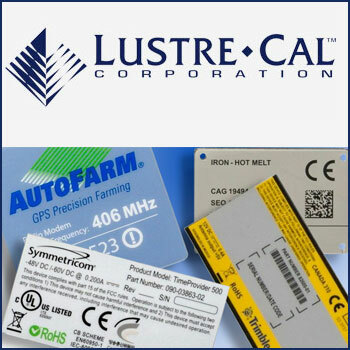 To manufacture customer parts, the company uses additive manufacturing (3D printing), as well as silicone molding, urethane plastic molding, and foam molding. Other process capabilities include metal casting, custom fabrication, custom finished appearance models, tools, jigs, and fixtures. The company’s finishing work may include painting and creating premium quality models for presentations. As an HP certified reseller, InterPRO offers HP Jet Fusion 3D printers. 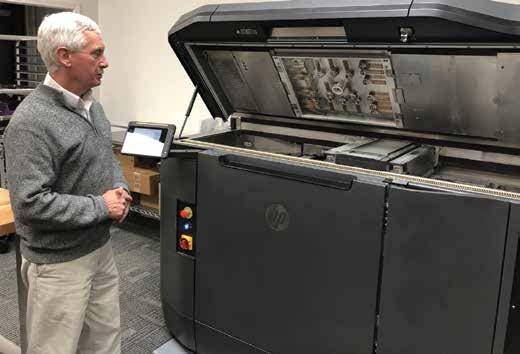 It trains buyers of the HP 3D printing systems in the new 4,500-square-foot Additive Innovation Center that InterPRO added to its plant in Deep River. Before offering the HP line of 3D printers, InterPRO was a reseller of Markforged 3D printers. Dyer said InterPRO’s combined offering—manufacturing 3D printed parts and selling the machines used to make them—gives customers an immediate advantage. Kevin Dyer, founder and CEO of InterPRO 3D Printing Service & Systems, discusses how HP Jet Fusion printing technology creates parts with light. Photo by Mark Langlois. InterPRO employs 19 people at its 11,500-square-foot facility, where it runs more than a dozen 3D printers 24/7. InterPRO’s services include stereolithography (SLA), selective laser sintering (SLS), HP Jet Fusion, Fused Deposition Modeling (FDM), PolyJet, and direct metal laser sintering (DMLS), also known as selective laser melting. The company can also perform CNC machining, rotational molding (rotomolding), vacuum casting, and pressure casting. “Engineers need prototypes to assess their form and appearance, to verify their assembly and fit, and to test their function. We also produce custom painted prototypes that are used as marketing and sales samples, and for evaluating new product ideas,” Dyer said. InterPRO works with product engineers, designers, and company management to help them see where 3D printing can add value. “It starts when a company engineer orders a few prototype parts to confirm they fit together. As their company discovers more ways to use 3D printed parts, their use grows to include functional testing and then 3D printed tooling. Along that discovery path, it begins to make more financial sense to install 3D printing capability on their production floor,” Dyer said. The new Additive Innovation Center is always open to visitors and allows InterPRO to demonstrate how 3D printing technologies can help a company improve design and manufacturing processes. This is also where InterPRO produces parts and trains HP system customers how to operate their 3D printing system. With the knowledge and expertise they’ve learned at InterPRO, trained HP system operators help drive improvements in their company’s prototyping, engineering, and manufacturing processes. “We show them how to do it the way we do, with hands-on training. Then we deliver ongoing value through strong collaboration and close support of our customers. When a company buys a 3D printer from us, it forms the basis of a long-term relationship. We’re here to support them with our capabilities whenever they need our help,” Dyer said. Dyer, who founded InterPRO after working for 3D Systems Corporation for eight years, said that older 3D printing technologies, including stereolithography (SLA), are evolving and changing even while new equipment and technologies are emerging. Despite the SLA technology’s being 30 years old, the SLA process “is still appropriate for a wide range of part types and applications. SLA is a proven technology that is developing new life,” Dyer said. Dyer said the older SLA technology has a more complicated software interface than newer additive technologies. It also requires more post production (hand finishing, cleaning, curing, rinsing in alcohol, and other steps). “It was the first 3D printing process. It’s a general-purpose process for a wide range of things, such as proving out the form, fit, or function of a part. It’s extremely accurate, it has a wide range of materials available, and it’s a very well understood and a very well controlled process. This enclosure half was 3D printed at InterPRO on a Markforged desktop printer using Onyx material. Photo by Mark Langlois. By way of comparison, the HP Jet Fusion 4200 and new color 580 printer might make three or four copies in the same time that an SLA can make just one of the motorcycle shown in the photograph with this story. “HP’s Jet Fusion printing technology builds parts up to 10 times faster than SLA, FDM, and other 3D printing technologies. Companies appreciate that speed advantage,” Dyer said. One aerospace engineering customer asked InterPRO to fabricate a high-fidelity model of a mission-critical subsystem for a future spacecraft. The model had to look as though it was made of aluminum and steel, and it had to integrate without fail with existing actual flight hardware. High-level government personnel had already scheduled a date for the part’s review, but the customer had not yet completed the CAD design for the part. “We worked very closely with the customer’s engineering and management team to tightly define the build, assembly, and painting schedule. It was paced by the availability of the customer’s CAD data. Long hours on evenings and weekends were required. We completed the project on time and to the customer’s satisfaction,” Dyer said. Dyer said the company’s 3D printing expertise, combined with the company’s design and engineering skills, helped them finish the assembly of the 3D printed parts with the actual component’s hardware by the deadline. The processes InterPRO used included SLA, HP Jet Fusion, and Markforged composite printing, plus CNC milling and painting. Some parts were hand fabricated from plastic, aluminum, and steel. The part was made of DSM SOMOS® EvoLVe, a high impact material; Somos® Taurus, a high temperature material; and Somos® PerFORM, a composite material. HP Jet Fusion Nylon 12 parts were also used along with Markforged carbon fiber/nylon parts. To achieve the effect, InterPRO workers used drills, files, screwdrivers, inserts, and 3D printed tooling. “The final model looked like the actual hardware that will fly on the spacecraft,” Dyer said. Dyer is looking forward to receiving the new HP Metal Jet Fusion technology when HP releases it in 2020. “We have space ready for it in our Additive Center showroom, where potential customers will see it in operation. We have customers who are budgeting to place system orders as soon as it becomes available,” Dyer said. 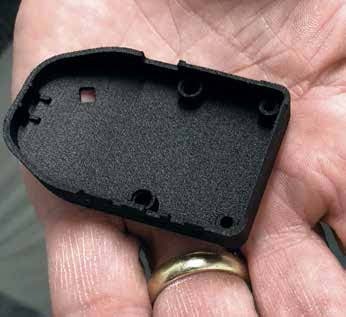 One of numerous reasons for the possible shift from injection molding toward 3D printing, Dyer said, is that molds for injection molding cost thousands of dollars. If a part can be 3D printed without that expense, manufacturers may go straight to 3D printing. Dyer said that in low production runs, up to as many as 40,000 parts, 3D printing is becoming more competitive with injection molding. The number of parts a customer needs changes the math between 3D printing and injection molding. If the customer wants 100 parts or 1,000 parts, 3D printing can make more sense now because the customer doesn’t have to pay tens of thousands of dollars for a mold and wait six weeks. Because of new equipment and materials, Dyer said, that number of parts is now in the range of 40,000. And it’s likely to keep rising. Dyer is so convinced 3D technology is ready for high volume production that he discontinued the company’s injection molding division two years ago. He said that for years, he recognized the importance and economy of injection molding, but that 3D printing technology was proving that it could compete in more cases with injection molding. Dyer listed several multi-national chemical companies that see a very large opportunity in materials for 3D printing. They include Henkel, owner of the Loctite brand, and BASF.